IRON COUNTY — A California man was arrested Tuesday afternoon for allegedly attempting to stab a Cedar City man with a ballpoint pen on a Las Vegas-bound Greyhound bus. 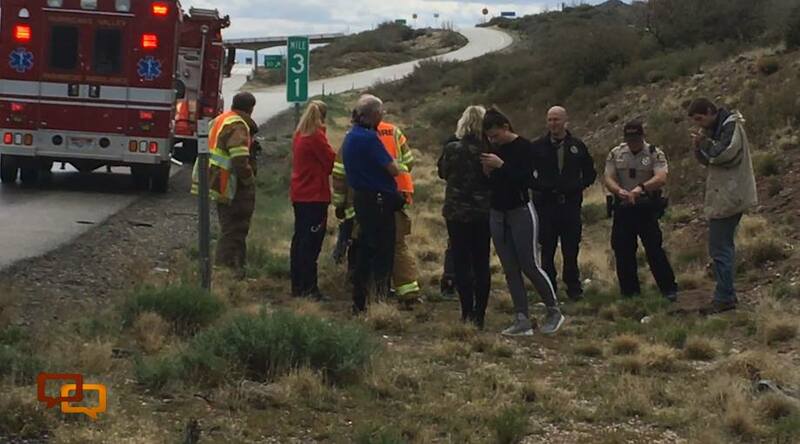 David Sigferdo Giron, 58, allegedly became suddenly agitated and began to yell paranoid rants at passengers on the bus as it traveled south of Cedar City on Interstate 15, said Utah Highway Patrol Sgt. Jake Hicks. Giron accused a Cedar City man who had just boarded the Greyhound of being out to get him, Hicks said, adding the situation escalated from there. “(Giron) became paranoid, stood up and came at the victim with the pen in his hand and tried to stab the victim,” Hicks said. The Cedar City man received minor self-defense injuries resulting from the attempted stabbing. The wound only needed an adhesive bandage, Hicks said. 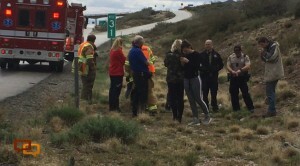 The bus driver noticed the commotion and stopped the bus near milepost 30 between Pintura and Browse before contacting law enforcement, Hicks said. During the incident the Cedar City man was able to gain control of Giron, holding him down with the help of another passenger to wait for law enforcement, Hicks said. By the time UHP and Washington County Sheriff deputies arrived things had calmed down considerably. Some passengers were outside the bus waiting alongside the road, he said, but Giron was found on the bus allegedly clutching the pen used to attack the Cedar City man. Based on their investigation, he said, the motive for the attack stemmed from mental health issues. Witnesses told troopers that Giron boarded the bus in Salt Lake City. Giron gave no indication if he was angry or could become volatile before the event unfolded, Hicks said. Giron was taken into custody by UHP troopers and booked into Purgatory Correctional Facility on a charge of aggravated assault/use of a weapon, a third-degree felony. His required bond is $5,000. I have never been on a boring Greyhound trip. “BEHAVE! Don’t make me stop this bus!” I haven’t been on a Greyhound bus since 1970 but I suspect sagemoon is right. Hey be nice to the guy . because when he is released he could be driving for Greyhound. and you could be on that bus. !